With the building communist onslaught of the Obama campaign and the ramifications to subsidiary countries of the USA like New Zealand, its time for us to reflect on some wisdom from a bigone era that is still relevant to all McCarthiest today. Communists and Socialists are devising clever and insidious new plans (like giant photos of Stalin) to lull our youth (particularly the pre-pubescent, clean-cut crowd) into a suggestive state of CommieReceptiveness (generally noted by a slow and repetitive nodding motion). You failed to stop Obama. You hippies are just useless. I was in the public toilets downtown Christchurch this morning and a shady gentleman walked in. I knew straight away he was a commie. His hair was parted from the left. I used to think hobbits were a bunch of lettuce eating communist homosexuals. But the Mighty Trevor showed me the light. 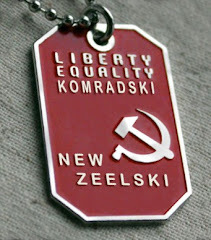 As soon as I am relased from parole, I shall follow Stormfront directives and move the the great communist free white bastion of New Zealand where true New Zealanders like fueher Trevor rule over the peseants.